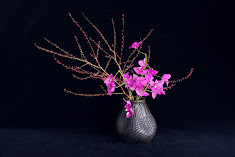 My client, a designer asked me to make an Ikebana arrangement for her wedding reception. She initially rejected all of my proposed designs and requested not to make a "pretty " arrangement. I used a container by Hiroe Swen and created this dynamic arrangement using her favourite lilies. I received fantastic feedback. The venue was the RACV club, Melbourne. Their staff was so helpful. Thank you.